Through any demanding cutting job, let "Priscilla" lead the way! Trekking through tall weeds, thick brush and dense undergrowth? Let "Priscilla" blaze your patch! A curvaceous beauty with muscle to spare, the Schrade Priscilla Makhaira Brush Sword packs far more bite and brawn than your average bush machete. Its full tang 16 1/16" 3Cr13 stainless steel recurve blade boasts an extra large belly, reinforced spine and carefully honed edge for maximum strength and slashing power, making quick work of even the most challenging, tenacious materials - woody branches, small trees, fibrous grasses and the like. The Priscilla's also great for myriad other cutting jobs, from cleaning and butchering game to chopping firewood and much, much more. Powder coated for added protection against moisture and the elements, the Priscilla's blade stays razor sharp and resilient in the harshest conditions, toughest environments and most unforgiving terrain. The Priscilla is also a pleasure to wield, with an exceptionally durable TPE handle that's textured for a no-slip grip and ergonomically contoured to boost comfort and reduce fatigue during use. Unlike many similarly sized machetes, the Priscilla's weight is impeccably distributed, bolstering swinging momentum and yielding greater cutting power with less effort. The handle includes a handy lanyard hole, and additional grommet holes and slots for lashing and tethering run along the edge of the included durable-yet-lightweight thermoplastic shoulder sheath. 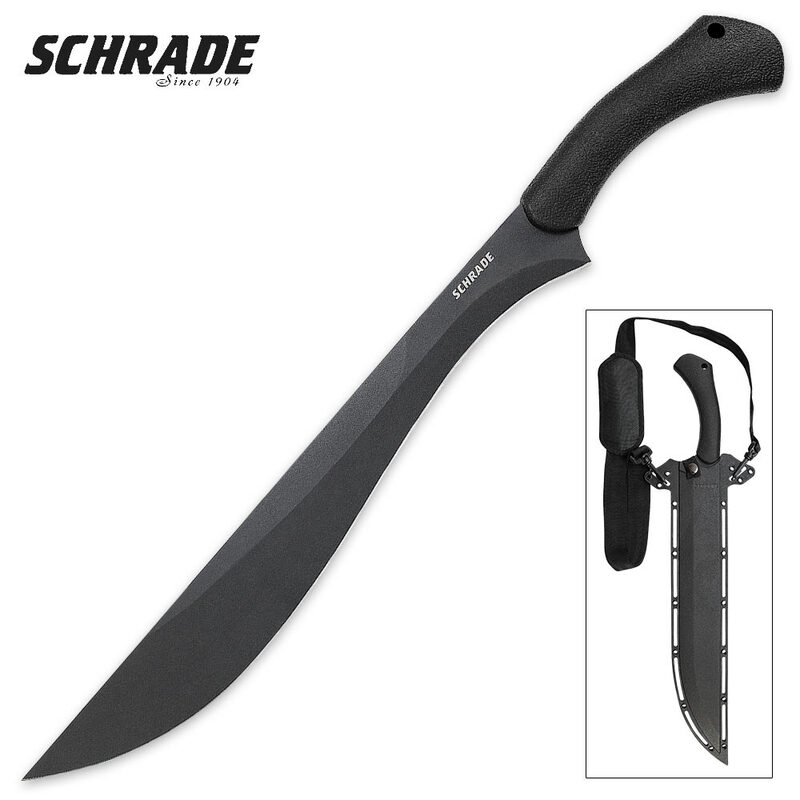 Whether deep in remote back country on an extreme wilderness adventure or simply in your suburban backyard cleaning up unsightly overgrowth, why waste energy trying to coax sufficient cutting power out of a feeble hardware store machete? For around the same price as (and often less than) an inferior tool, you can experience real slashing prowess with the surprisingly affordable full-tang Schrade Priscilla Makhaira Brush Sword,. You'll not only cut down obstructive or unwanted vegetation, you'll significantly trim cost, energy expenditure and work time! This is the absolutely best small sword I have ever seen, bar none! The design is stunning. The construction is solid, full tang, balanced and just the perfect weight. If there were only one of these available and there were no more to be made, I would trade ALL of my knives and swords (around twenty five) for this one sword. I will agree with the other reviewer about the sheath. This sword deserves a much better sheath. Please Schrade, make a really good sheath for it. I will bjuy two.